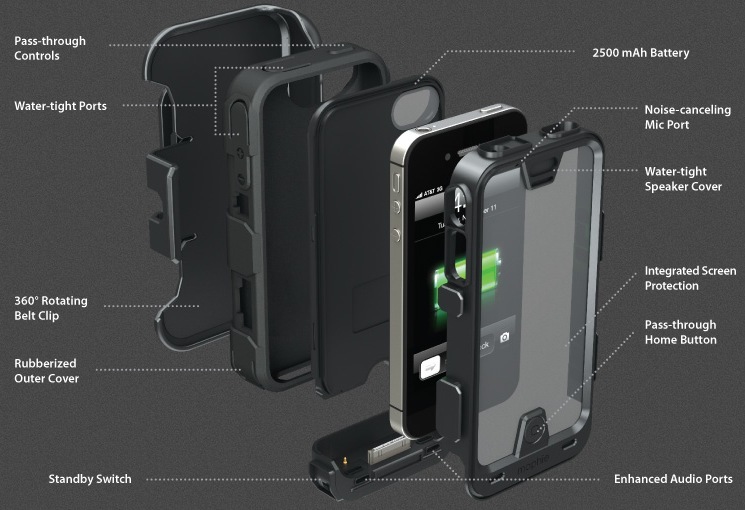 Mophie introduces its rugged juice pack PRO, which is the largest juice pack battery case compatible with iPhone 4/4S. Not only powers your iPhone, the new battery case also protects your iPhone from extreme conditions. For a full protection, the case wraps the iPhone with a high-impact polycarbonate inner shell, silicone protective wrap, waterproof speaker cover and anti-glare screen protector. It has a an impact and environmental-resistant design that exceeds military specification MIL-STD 810G, protecting the iPhone from extreme weather conditions, including rain, sand, dust, and safeguarding from drops, vibration and shock. As the largest juice pack for iPhone 4/4s, the juice pack PRO sports a 2500mAh battery to provide 150 percent extra battery for the iPhone 4/4S. The rugged battery case provide full access to home button, volume control and power button. It has microUSB port and comes with a USB cable for charging and syncing the iPhone without removing it from the case. There is a on/off toggle switch that allows for standby and charging mode, and an integrated 3 LED status indicator. Also included is a quick-draw, shatter-proof and rotating belt-clip, keeping the device securely on the hip. The Mophie juice pack PRO rugged iPhone battery case is priced at $129.95.